Not long ago, my second cousin gave me a lovely songbook that had belonged to her late mother, Benita Jane (McCormick) Olson and before her, our mutual great grand aunt, Agnes Gaffney. 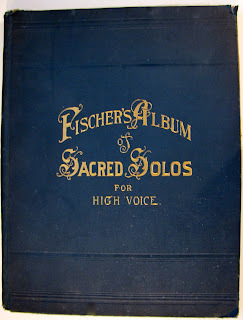 Titled Fischer’s Album of Sacred Solos for High Voice, it evidently was given to Agnes by her older sister, Lyle (Elizabeth) Gaffney, in 1895. Agnes would have been 23 at the time. Perhaps that is her approximate age in the photo at right, part of a larger group portrait taken with her five sisters, Janie, Lyle, Maggie, Di, and Frances. 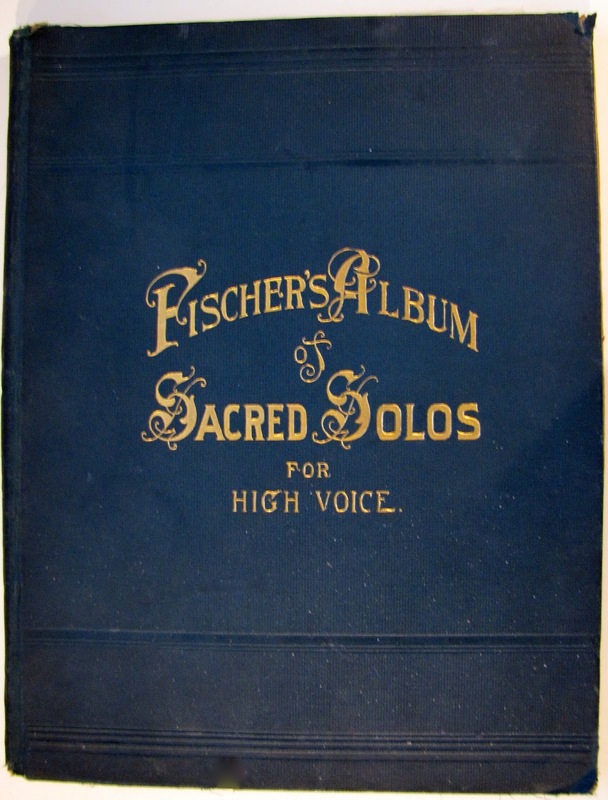 The book was published by J. Fischer & Bro., an American music publishing company established by brothers Joseph and Ignaz Fischer in 1864. Originally based in Toledo, Ohio, the brothers moved the company to New York City eleven years later. The company appears to have published mainly sacred and secular music for choral groups, with organ or piano accompaniment. Aunt Agnes’ hymnal of solos for high voice. Agnes’ book is quite large, measuring about 10″ x 14″. Its 116 pages, beautifully edged in red, contain sacred music from some of the great composers, including Gounod, St. Saens, and Verdi. It remains in good condition, though the corners have become dogeared and the cover has begun to fray. The first page, inside, is dedicated to Agnes by her sister Lyle. New York and Toledo, Ohio, by J. Fischer & Bro. Born in Conneaut, Ohio, on April 6, 1872, Agnes Catherine Gaffney was the youngest surviving child in the family of of ten Gaffney children. 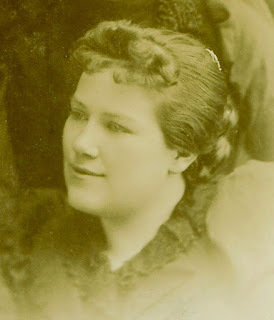 She was said to be “as sweet as the day was long,” and her niece, Benita (McGinnis) McCormick, wrote that she had the “voice of an angel.” Her grand-niece (my mother), Joan (Schiavon) Huesca, also admired her beautiful singing voice, understandably so given that she could not carry a tune herself. Singing in her church choir was one of the things Agnes would have been encouraged to do as an educator and influential member of her community. 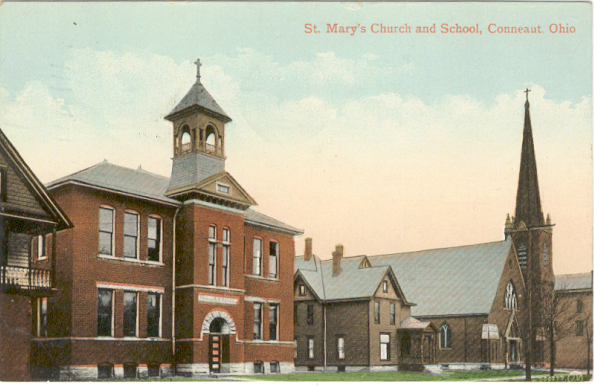 I can picture her, primly dressed, opening her book during Sunday Mass at Saint Mary’s Parish, which was right down the street from the Gaffney House. I can imagine her stepping forward for her solo, looking demurely down at her book and glancing up towards her family as she sang the Ave Maria in her soprano voice with all her heart. Maybe her dulcet voice was partly the reason this hymn was a Gaffney/McGinnis family favorite.